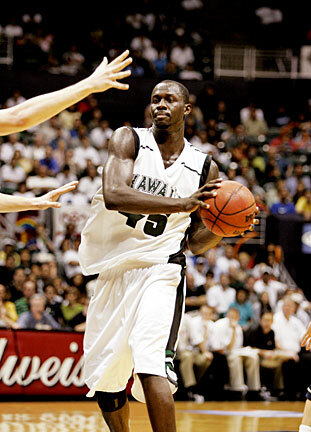 Forward Ahmet Gueye led UH with eight rebounds in 36 minutes last night. This game was won and lost during the recruiting wars. Forward Ahmet Gueye and guard Matt Lojeski were both wooed by Utah State, and both were huge in UH's 69-59 win yesterday at the Stan Sheriff Center. They provided 32 points, 13 rebounds and -- perhaps most importantly -- seven blocked shots and solid defense. From Aggies coach Stew Morrill's perspective, Gueye and Lojeski would've looked mighty nice in blue instead of green and white. "We tried (to recruit the two junior college transfers). That's all we can do," Morrill said. "Some others tried, too." Lojeski lit it up with a game-high 20 points and guarded USU's top scorer, and Gueye was a menacing defensive presence with four blocks and a game-high eight rebounds to go with 12 points. Lojeski added three blocks, and the Rainbow Warriors totaled nine, two off the school record. Guard Jaycee Carroll, the Aggies' leading scorer with 15, was kept a full five points below his average. He looked like business as usual in the first half with 10 as Utah State took a 35-32 lead into the break. But Carroll was completely shackled in the second half until he scored five points in the final 29 seconds after UH had ended the drama with a 68-54 lead. Gueye provided the game's most spectacular and pivotal defensive play with 9:36 left and UH clinging to a 49-47 lead and Carroll with the ball. Gueye went to the top of the key to block Carroll's 3-point try and then grabbed the loose ball. It occurred during the middle of a 7-0 UH run that gave the Rainbows control of the game. "We were working on that the whole week," Gueye said. "At first we had a hard time figuring their offense. Once we figured it out, it was over." Morrill credited Gueye and the rest of the Rainbows' defense, but also said the Aggies lost their patience. "Ahmet plays 4 inches taller than he is (6-foot-7). He has great timing and long arms," the coach said. "And we got stupidly stubborn. You can't drive and have three or four guys on you (and shoot)." Lojeski is 6-6 and Carroll is 6-2. Lojeski said it helped. "He wants to just catch and shoot and I think my height advantage was good," he said. "I had to contest a lot of his shots and cause him not to take shots because I got my hand up." Carroll couldn't get open, and hesitated when he did after the Gueye block. He altered his tactics. "I tried some shot fakes to draw some fouls, try to adjust. But it didn't work very well," said Carroll, who made one of eight shots from the floor in the second half. "We didn't screen very well for each other and they guarded me well." Forward Nate Harris came in averaging 14.3 points per game. He had 12 yesterday, but on 2-for-9 shooting from the field. "All of us got caught up in rushing things because they were blocking shots. Usually I try to make nice, solid moves, but I rushed," he said.